Sharpen your bat'leth and prepare for war in this collection of unforgettable Klingon tales from the Star Trek universe. 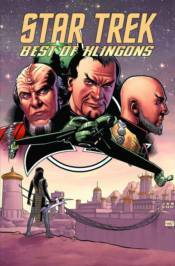 Including the original 4-part DC start to The Original Series as well as the 6-issue 'Klingons: Blood Will Tell' series by Scott and David Tipton, this volume is fierce and loyal to the Empire. Heghlu'meH QaQ jajvam!